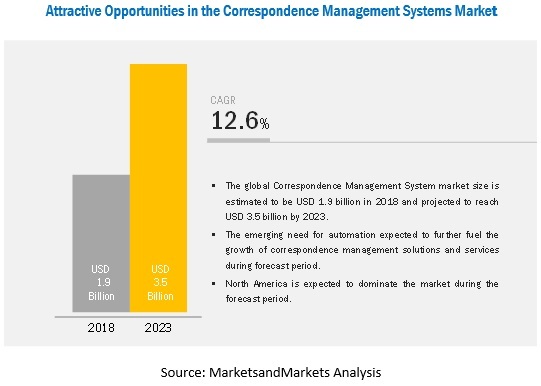 The correspondence management system market size is expected to grow from USD 1.9 billion in 2018 to USD 3.5 billion by 2023, at a Compound Annual Growth Rate (CAGR) of 12.6% during the forecast period. The demand for correspondence management system is expected to rise over the next 5 years owing to various factors, including the need for reducing planning and budgeting cycles. Moreover, automation of internal and external communication has been immensely growing with the rise of big data and analytics solutions. Furthermore, to efficiently execute real-time communication, organizations are rapidly adopting correspondence management solutions to manage all the correspondences.Additionally, the correspondence management systems are a valuable solution for organizations as they help in reducing paper wastage, which in turn reduces the cost of printing. Because of this, many organizations are increasingly transitioning into a paper-free environment. This can be efficiently achieved with the use of correspondence management systems. Business need for any organization varies with the workforce they are employing and with the nature of its business. Companies, at times, need greater visibility into costs, resources, and performance, and requires to improve accuracy, efficiency, controls, and auditability. Correspondence management system automates and, thereby, offers speed and agility for delivering better insights about the customer and internal affairs. Digital transformation is helping organizations in meeting client’s requirements at a faster rate. The correspondence management system solutions enable businesses to enhance revenues by keeping the customers and shareholders informed through regular correspondence. This is one of the major factors leading to the growing adoption of correspondence management system solutions and services. Another factor accelerating the correspondence management system market is the emergence of new IT applications and infrastructure such as big data and advanced analytics. With Correspondence management system, companies can leverage big data helps make more accurate decisions through predictive capabilities of correspondence management system solutions. The automated and personalized communication system is highly useful in managing the correspondences across industries, such as Banking, Financial Services and Insurance (BFSI), healthcare, and telecommunications and IT, as these industries follow defined, repeated, and rule-based processes. Automated communication system reduces inconsistencies and terminations of correspondences in the business environment, thereby enabling effective internal and external communication system. Considerable time is wasted or used inefficiently in managing paper documentation, especially when a high percentage of the data is created and generated electronically. Correspondence management systems are a valuable solution for organizations as they help in reducing paper wastage, which in turn reduces the cost of printing. As a result, many organizations are increasingly transitioning to a paper-free environment. It can be efficiently achieved with the use of correspondence management systems. The demand for the cloud-based deployment model is expected to be increasing rapidly. With availability and accessibility, cloud-based deployments are gaining traction. Another major reason for increasing cloud-based deployments is the transition of systems from both the large enterprises and small enterprises over the cloud. As it saves time and additional expenses and maintenance costs small enterprises, in particular, implement correspondence management system platforms using the cloud deployment model, as it enables them to focus on their core competencies rather than investing more capital on their IT infrastructure. The global correspondence management system market by region covers 5 major geographic regions: North America, Asia Pacific (APAC), Europe, the Middle East and Africa (MEA), and Latin America. North America constitutes the highest market share, owing to the growing adoption of automation as well as the increasing need for efficient customer and internal communication for better retention in multiple industry verticals, such as retail and eCommerce, BFSI, and government. The US and Canada are 2 two prominent markets in North America that are witnessing healthy adoption of advanced technologies, such as correspondence management system solutions. 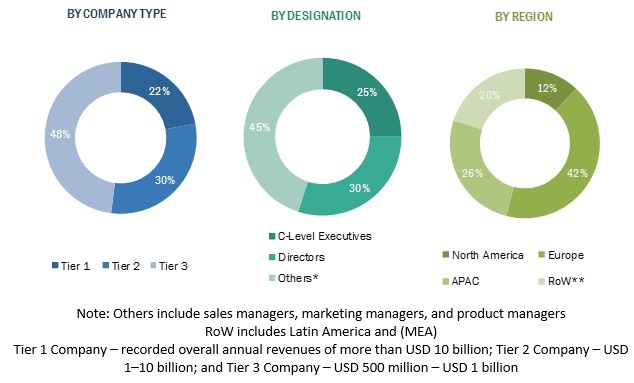 The correspondence management system market comprises major providers, such as IBM Corporation (IBM), Microsoft Corporation (Microsoft), Adobe Systems, Inc. (Adobe), Opentext Corporation (Opentext), Pitney Bowes (Pitney Bowes), Rosslyn Analytics (Rosslyn Analytics), Micropact (MicroPact), Fabasoft AG (Fabasoft), Newgen Software Technologies Limited (Newgen Software), Top Down Systems Corporation (Top Down Systems), Everteam, Xerox Corporation, Palaxo International LTD (Palaxo), and Catec (CATEC). The study includes an in-depth competitive analysis of these key players in the global market with their company profiles, recent developments, and key market strategies. In February 2019, MicroPact upgraded its platform by launching a new version entellitrak 3.30. The new upgrade would help customers build their applications. In January 2019, OpenText acquired Liaison, a cloud-based integration and data management company. This acquisition would strengthen OpenText’s application network product offerings in the areas of SaaS, cloud, mobile, and omnichannel. Moreover, ALLOY platform of Liaison would be integrated into OpenText Business Network. In November 2017, Microsoft partnered with SAP to give customers a trusted path to digital transformation in the cloud. With this partnership, the companies would co-engineer, go to market together with premier solutions, and provide joint support services to deliver the best cloud experience to customers. In February 2017, Fabasoft upgraded its cloud offerings by adding new Fabasoft Cloud features, which bring unlimited digital records management in an organization to a new level. According to new features enterprises can define forms and templates individually and the process can be executed by 2 or more persons in parallel. In May 2016, Adobe acquired Livefyre, a technology solution provider based in the US. Adobe included Livefyre, into its Adobe Experience Manager product family. This acquisition enables customers to unify the best social media content from Twitter, Facebook, Instagram, and other social networks. This would accelerate content marketing and drive customer engagement and conversion. What are the opportunities in the correspondence management system market? *Details on Business Overview, Platforms and Services Offered, Recent Developments, SWOT Analysis, and MnM View Might Not Be Captured in Case of Unlisted Companies. The study involved 4 major activities in estimating the current market size for the global correspondence management system market. Exhaustive secondary research was done to collect information on the market, the peer market, and the parent market. The next step was to validate these findings, assumptions, and sizing with the industry experts across the value chain through primary research. Both top-down and bottom-up approaches were employed to estimate the complete market size. After that, the market breakup and data triangulation procedures were used to estimate the market size of the segments and subsegments. Various primary sources from both supply and demand sides of the correspondence management system market ecosystem were interviewed to obtain qualitative and quantitative information for this study. The primary sources from the supply side included industry experts, such as Chief Executive Officers (CEOs), Vice Presidents (VPs), marketing directors, technology and innovation directors, and related key executives from various vendors providing the correspondence management system associated service providers, and system integrators operating in the targeted regions. All possible parameters that affect the market covered in this research study have been accounted for, viewed in extensive detail, verified through primary research, and analyzed to get the final quantitative and qualitative data. This research report categorizes the correspondence management system market based on delivery channel, component, application, deployment mode, organization size, industry verticals, and regions.